Here’s another custom military application by TECA. 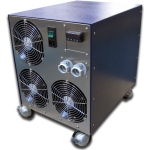 The United State Navy needed a liquid chiller to circulate coolant and also meet strict military requirements. 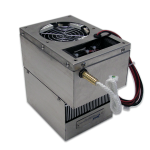 TECA developed a custom thermoelectric liquid chiller using MIL rated components. 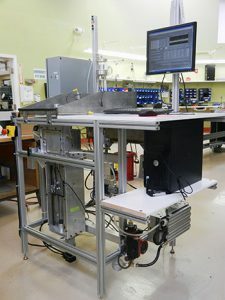 This is a liquid chiller for circulating chilled coolant as part of a tracking system on a NAVY ship. Note that the chilled liquid circuit is effectively “sandwiched“ between two heat sinks with rugged Mil 901 fans. 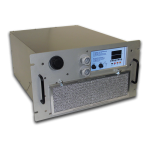 Wiring and electrics are housed in a NEMA-4X enclosure with an O-ring gasket seal. 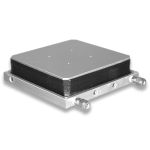 This unit is rated for shipboard use in salt-spray, shock and vibration. 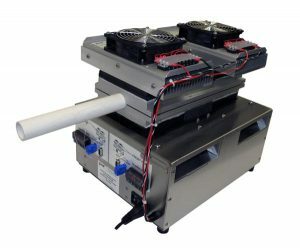 The customer needed a compact thermoelectric cooling system to cool flow of fluid through removable membrane liquid jacket used in a mobile medical application. TECA’s sales and engineering team worked with the customer and developed the product you see in the pictures above for the exclusive use of our customer. The application is medical and will be protected by patent. Thermoelectric cooling will be employed for effective cooling of the brain for emergency treatment of stroke victims. 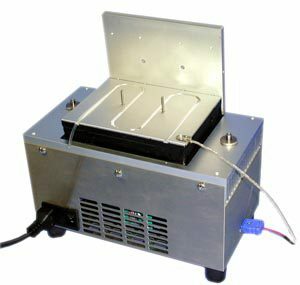 September: Initial contact: Need help sizing unit that can maintain a liquid temperature between 25 °C – 35 °C in ambient conditions of 15 °C – 40° C. I need a unit for testing ASAP. In conjunction with sizing a chiller, I am also trying to size a heat exchanger. I need chiller flow rate and output temperature. Please call to discuss details. 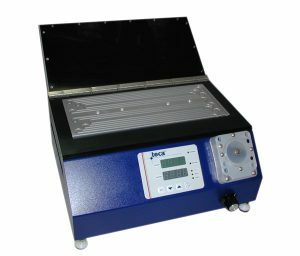 A commercial laboratory uses TECA Chiller TLC-1200HC to discourage temperature gradients in a calibration system. Utilizing the built in temperature controller, the customer was able to successfully run the input and output to a temperature difference of zero. Designing a suitable calibration method was critical to the customer’s ability to release a new product to market. The photos here illustrate the compact size of TECA’s TLC-1200HC. A potential customer expressed interest in a cooling/heating system for an aerosol flow tube envisioning a 1 inch OD, 0.875 inch ID stainless steel flow tube mounted inside a 2-2.5 inch ID pipe (likely also stainless steel and insulated on the outside) capable of controlling the tube at temperatures ranging from roughly 5 °C to 40 °C at an ambient temperature of 25-30 °C. We are measuring the change in particulates in the air due to the temp change. 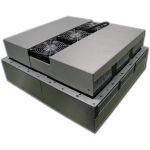 Standard liquid chillers were first offered along with technical design assistance. 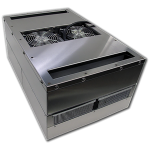 The requirements led to direct contact cooling as being a good solution. 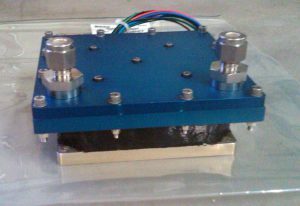 Standard cold plate products and controllers were offered which led to this request for a custom package. 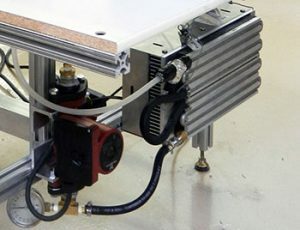 “We would like to have the flow tube sandwiched between the cold plates with the temperature controller and power supplies attached in a similar manner so that we only need attach the temperature controller (the TC-3400 appears as if it will work) to a computer so that we can change the set points remotely. Is any of this even possible or am I dreaming in Technicolor?” We advised him that the best dreams were in color. Preliminary design work was done and a quote prepared. Shortly thereafter an order was received; design documents were completed and sent to production. Less than 3 months after the initial contact the product was shipped. Several months later a follow up was made with this response. “Things are doing really well. It does exactly what we wanted it to do, and is much more efficient and better than we hoped for. We’re very happy! 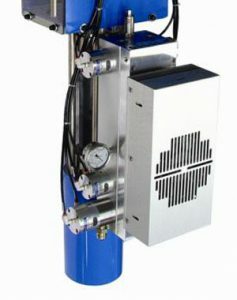 A customer needed to cool high pressure flow of fluid in a single pass. 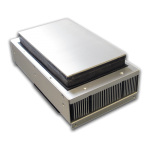 Using expanded Aluminum foam and attaching it to the surface of AHP-301CP thermoelectric cold plate (peltier cold plate) provided a way to maximize the thermal contact surface and eliminated the need to complex fluid path and larger cold plate. 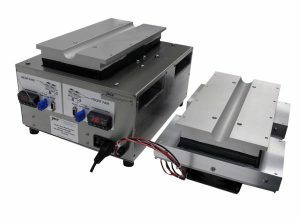 A leading manufacturer of fluid dispensing systems uses one of our Thermoelectric Cold Plate and Temperature Controller for controlling the fluid temperature of adhesives, sealants, lubricants and other materials in meter, mix and dispensing systems. 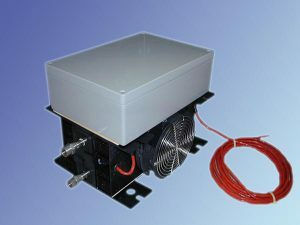 Unlike other larger, higher cost and less accurate heating and cooling devices, which use heater cartridges, refrigerant or water to heat and cool, these thermoelectric-effect temperature controllers use the Peltier-Seebeck effect to directly convert electrical voltage to thermal differentials. This effect, which is reversible, either heats or cools fluid materials with precision to the temperature set point. 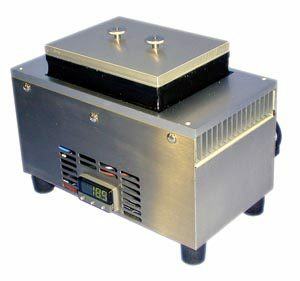 The compact Peltier thermoelectric device, temperature sensor and the temperature control is mounted to a manifold where the fluid passes through to be precisely heated, maintained or cooled. 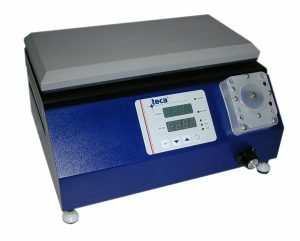 Chilling liquids being circulated by a peristaltic pump under ultra-clean conditions. When handling and processing various fluids in laboratory and electronic environments cleanliness is a must. 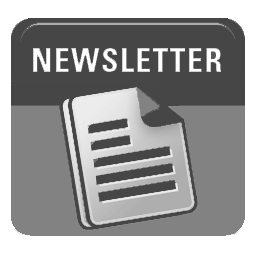 Peristaltic pumps have been developed for the purpose of creating a fluid flow without contacting the fluid itself. 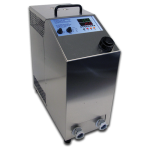 TECA developed a liquid chiller to cool fluids, while satisfying the same cleanliness requirements. 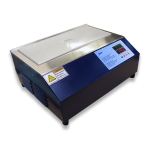 The solution, based on our successful cold plate product line, has proven to be versatile and effective. 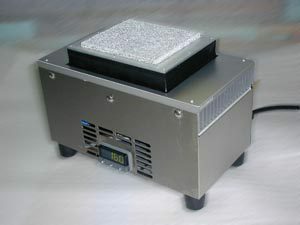 Pictured here is the first prototype of a multiple-pass tube cooler for use with a peristaltic pump. Applications range from laboratory to medical to industrial. The customer needed to cool a very low flow rate of a very pure fluid. Passing tubing through an ice bath did not provide close enough and consistent enough temperature control. 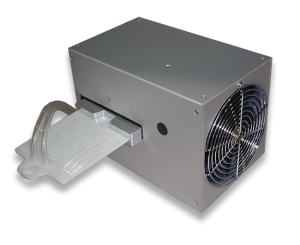 However by using the AHP-1200CPV with tube chiller option and by determining the optimum set point a consistently cooled flow of the pure fluid was obtained. 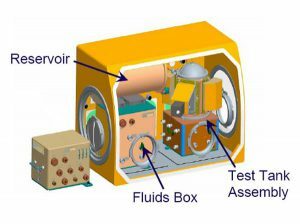 Cryogenic fluid is extremely sensitive to temperature and pressure changes within an experimental environment. 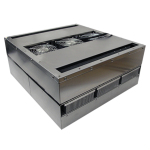 A custom-modified version of TECA’s LHP-300CPHC Liquid-Cooled Cold Plate is installed as part of a system which allows the customer to closely monitor and control temperature. 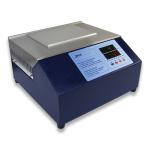 The long life expectancy and low maintenance requirements of the LHP-300CPHC offer reliability and convenience to the customer’s long-term research experiment.